So last Friday we posted blog written but not quite finished on Thursday. In the 24 hours between writing and posting things had moved on yet again with the H Team. 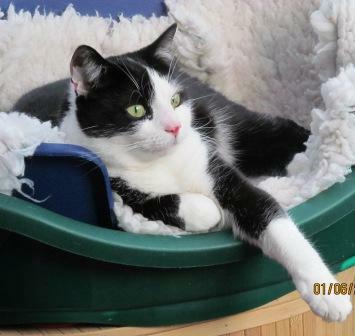 Just after 4.30 last Friday afternoon I had a message from Bosca’s lovely mum asking if Hecate was still looking for a home. Yes, she is … and really needs out of rescue because its stressing her. However she’s very reserved and not sure how she’ll be as a pet. Wondering how she might be away from the kittens, with a bit more space and 1:1 attention. Bosca’s mum really missing the company of having a cat around. [You may remember the lovely Bosca had heart problems and went to Rainbow Bridge a few weeks ago] Would she be interested in fostering Hecate and seeing how it goes? Yes. When can they come to meet her? Now. OK. After a brief meeting where Hecate is a bit aloof but puts her tail up whilst being stroked, and leans into a chin rub we have a deal 🙂 I wait while 6pm to set off to take Hecate round there to avoid the worst of the traffic. Not quite believing that between initial text and landing on their door step has taken less than two hours. Hecate struts of out of her carrier, explores a bit and then sits under the same cabinet Bosca initially hid under. Although she’s hiding, she seems relaxed under there, and has been walking around with her tail in the air and happily checking the place out. 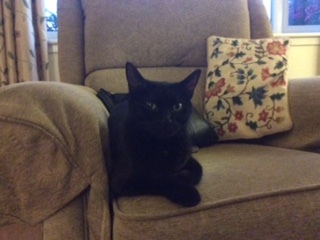 Later in the evening I got a message that she’d found the litter tray and was now settled in the chair. 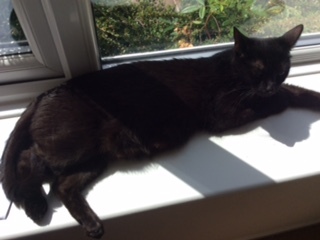 And by Saturday morning she’d found a nice warm sunny spot on the windowsill. For a cat who has lived outdoors most of her life, struggling to feed herself and kittens, this must be heaven. Then it was time to think about how to make progress with the kittens. You may remember that Henry & Harvey had come downstairs to live with the residents a few weeks ago and were growing in confidence. Hector & Herbie were still upstairs with mum. 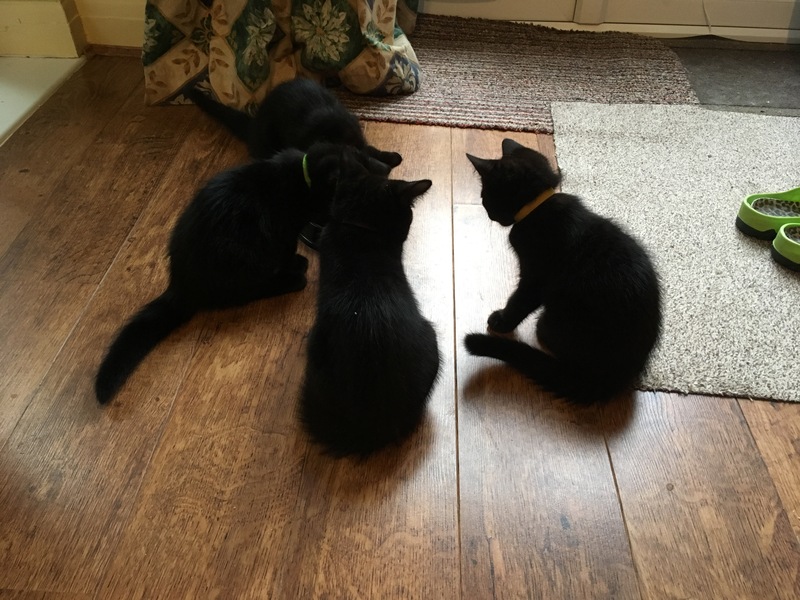 On Saturday morning we decided that the best plan was to bring them downstairs to join their brothers. As with their previous attempt to come downstairs, there was a lot of hissing and growling. Despite being brothers and being close for most of their lives they claimed to have never seen each other before. I don’t know if its just me … but listening to kittens growling and squabbling all day really grates on the nerves. It took while Tuesday for it to be anything like civilised. They’ve still been very clearly divided into pairs but gradually less likely to be fighting. A week on they seem to be back to being a team of 4. As far as confidence goes … they’ve come on in leaps and bounds this week. I’m so pleased and excited … and relieved. Despite their arguing, they do seem to have helped each other. Here’s Henry demonstrating to Hector how snuggles can be fun …. and Hector looking rather unconvinced …. though he’s been more than persuaded since that photo was taken. My best ally in this project is our precious Henderson. He may have been someone’s castoff grubby old tom cat … but he’s my most reliable colleague. Apart from being just a steady presence for the kits and letting them snuggle up to him, he’s helped them start to enjoy human contact. He enjoys his snuggles with me and purrs loudly. The kits trust him … and are used to the sound of loud purrs signalling a happy feed with mum …. so they come running to join him. He’s gradually building up the number of kittens who are flocking to him. It’s hard to get photos when they’re all piled on your lap … hence the photos when they’re beside me. 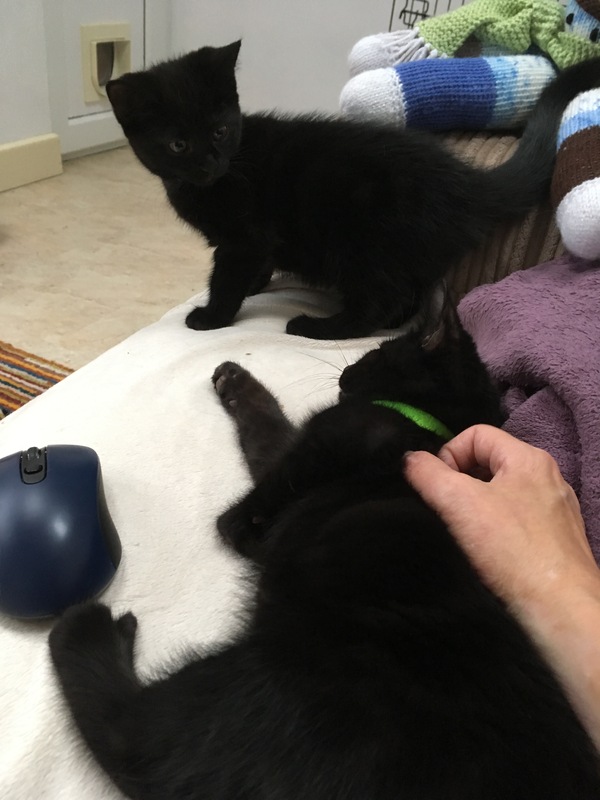 It’s felt a looooong week in many ways … but brought us to a point right now as I’m finishing this blog, where Hendo is off doing his own thing, and all 4 kittens are on the sofa beside me … purring loudly. Given their wariness of people to start with this is just awesome.